The Mamiya 6 medium format rangefinder was one of the coolest little camera systems ever made. It was simple; a collapsing rangefinder body taking 120 or 220 film, three lenses (50, 75 and 150mm) and that's about it. Boy, did this camera hit all the right spots. Pretty small, nice big negative (56mm X 56mm actual size, usually called 6X6 for 6cm squared). Judging by the cover, it was so light it floated! 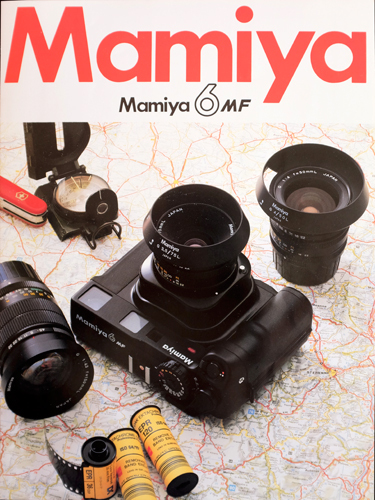 (this turned out not to be true, in fact it's a very solid piece of gear) Apparently Mamiya introduced these in 1989 but I only found out about them in 1992 (why was I not informed?). I bought a Mamiya 6 with the 50 and 75mm lenses. It was expensive; about $3,000 and in 1992 dollars too. Many years later I'd add the 150mm lens used off eBay. What a spectacular camera! It is a highly portable 6X6 rangefinder, solid, dependable and a joy to use. Nothing whizzy about it, deceptively simple but providing exquisite images if you paid attention and your skills were up to par. I used the M6 (as I referred to it, even though that's a Leica camera model) as my main snapshot camera through the 1990s and into the early 2000s. The cost of processing and printing 120 film kept rising and I deferred increasingly back to 35mm and then later digital as time went on, but I still have this camera and roll it out sometimes for the sheer joy of using it. 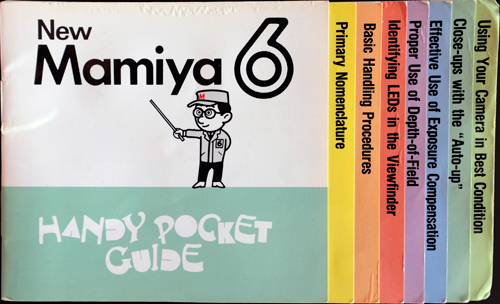 In 1992, when you spent three grand on a medium format collapsible rangefinder, you also got the laminated New Mamiya 6 Handy Pocket Guide with the little dude with the cap and pointer. This hilarious little laminated publication came with my M6, something you'd never find with, say, your Nikon F3HP. I particularly like the little camera icons running from rain, shivering in the cold, sweltering in the heat. I don't know how big the overlap was between people blowing three grand on an M6 and those needing a laminated guide with cartoon cameras saying Keep Your Camera Dry, but I sure appreciated the effort! And, mock it though I may, it's a bit wrinkled because I've sent it along with the camera a couple of times when I lent it out to friends. Maybe Nikon should have done one for the F3! 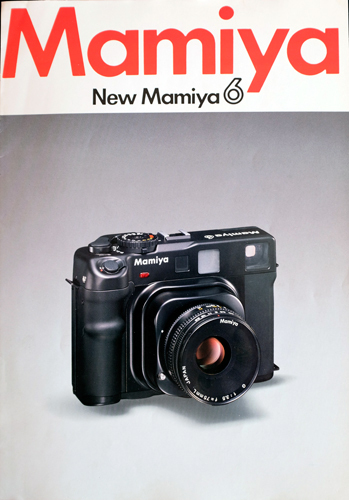 The updated Mamiya 6 MF came out around 1994(?). The MF stood for multi-format because it allowed the camera to take some different format photos. Oh boy! The stupidest of these was the 645 adapter which gave you 6 X 4.5cm images. Why would you do this? Well, 645 cameras are more compact, take shorter lenses and get 15 or 16 photos per roll rather than 12, depending on how efficient the designers are with their film transport and how miserly with inter-frame spacing. The Mamiya 6 MF did none of this; it was still the same weight and size, now the lenses were a bit longish and probably heavy for the format and, worst of all, the 645 kit just masked the top and bottom of the frame! You STILL got 12 photos a roll, not 15 or 16! This seems amazingly stupid. You could just mount your full 6X6 negative in a 645 carrier if you want to mask it down. They also made a 35mm kit which jumped through hoops to allow you to take 24mm X 54mm panoramas. Oh boy! Again, you might as well expose the full 6X6 frame and then go to work with scissors and a panoramic slide mount or negative carrier. Fortunately, these silly multi-format "features" were optional accessories. The body just had the ability to accept them if you felt so inclined. The only downside is that the frame lines in the viewfinder got cluttered up with tick marks showing the 645 and 35mm framing guidelines. Nobody needs that crap! Envision yourself, equipped with your Mamiya 6, all three lenses, a prismatic compass, a Swiss Army knife (with corkscrew of course, just out of frame) and a map of the area around Aurillac and Saint Étienne you've come to know so well as you work out tomorrow's route in the Massif Central. Your dinner of soupe de farine jaune, saucisson de Lyon avec des pommes de terres, marrons glacés and fromage du Saint-Felicien sits well with you as you finish off your Château Grillet back in your room, cleaning your gear and preparing for tomorrow. A couple of rolls of 120 Ektachrome 64 Professional are out as is a 36-exposure roll of the same emulsion for your Leica, or possibly for the counterfeit Mamiya 35mm panorama kit you rashly bought from that street urchin in Algiers last month. A bemused smile passes at the memory: Algiers! Ah well, at least it was only this panaroma kit after an evening in the darker corners of the Casbah, not a camel like last time. Anyway, you prefer the Ektachrome as a perfect complement to the contrasty Mamiya and Leica lenses. Long experience has taught you to take care to match emulsion batches for consistent color rendition. Now it's important to be ready for your early departure to catch dawn over the Massif. Your BMW is fueled up and ready out in the stone courtyard. The R65 has once again been a trusty steed and you'll store her back in the barn outside Marseilles in a fortnight before flying home to present this shoot and work with one of your selected clients to choose your next assignment. Fortunately, the Mamiya 6 MF allows you to remain responsive and nimble while exerising your vision and delivering incomparable results. Ahh, now the wine is done, the gear stowed, your nightly ablutions complete, so you switch off the light and drift off to the muted sounds of happy laughter and snatches of Édith Piaf drifting through the fragrant summer air from Madam Talaudière's café across the road. Bonsoir, mon ami, bonsoir. Then you move to page 2. This brochure might take a while. Camera brochures are great at this. Nikon did one in the early 1980s where the cover shot was a nightstand with the light on, a map of Scotland, a Nikon F2AS, some Kodachrome and (if I recall correctly) 24, 35, 55 Micro, 80-200 and 300 EF-ID lenses. There may have been a wee whisky as well. I was filled with a powerful yearning for both a Nikon F2AS and a trip to Scotland, both of which I eventually got, though not at the same time (I had my Nikon FE by the time I went to Scotland, and went with 20, 28, 35 PC (Perspective Control), 55 Micro and 105. Also maps of Scotland, lots of Kodachrome and a motorcycle, though just a rented Honda rather than a stashed R65 I keep outside Marseille). What can I say, I'm a slave to advertising. It's funny how they never have a map of, say, Ohio, as the background, otherwise I might find myself dreaming of Akron.